I have been writing about my writing, avoiding spoilers, but trying to paint a portrait of the day-to-day oddness that is the core of writing any novel. I want to thank the kind people who have been waiting for this book for far too long (there are reasons, not interesting ones, for the delay). Hungary, Macedonia, Malaysia, Ukraine, New Zealand, !! Olive trees, those ancient, patient trees that watched Rome rise and fall. I wrote most of the chapter yesterday, was amazed at the turn it took, stopped writing and answered fan messages for an hour or two instead of facing what I knew was coming. Today, NOW, I have to go back. The City of Limori has been destroyed by war so many times over the centuries. Wizards and kings, back and forth, the people swept up into a battle they become convinced is their own. But it isn't. It never was. This is a Euphorbia. The thorns keep it safe. And if that isn't enough, the milky white sap can burn your skin or blind you. I was awake much of last night and slept in until 7:30am-- unusual for me. I have been sitting at the desk, writing notes from last night's insomnia-blast of revelations. I am just about to start writing for the day, a chapter with Hahp and Gerrard. They have learned to survive the pressure and disorientation of the dark passages they live in, the strange tests they are given. But now, the wizards are gone and everything has stopped. Why? The moon and one star. Taken with a shaky handheld camera, the lens madly searching for light. I held my breath and counted to sixteen before the shutter finally snapped. I do critiques sometimes and yesterday was full of talking to people about their work. It's always interesting and always makes me see my own work more clearly. So today I am going back into the dark stone corridors with no idea what will happen, just that I need to be there to record it when it does. Silk floss trees would rather be in South America, but they tolerate California. The thorns are huge, and store water in dry seasons. They can grow to 60 feet. mine is about 20 feet tall now. The blooms always surprise me, like they were meant for some other more delicate, more poetic, less thorny tree. I am hoping for unexpected blooms today, for Sadima and Hahp. And Gerrard. Maybe especially for Gerrard. 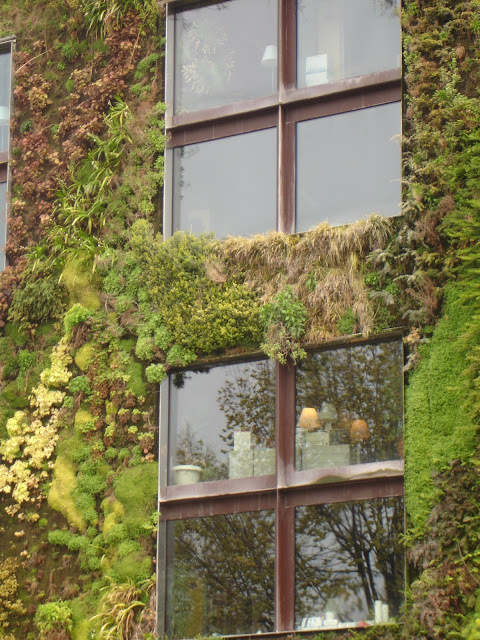 A bio-green-building in Paris....the windows are reflecting the trees across the street. Do they talk? The wall-plants and the ground plants--do they discuss flat ground and roots pointing down vs. roots clinging to wire frames filled with soil three stories up and having roots parallel to the ground? An amazing thing is happening in Limori. Last night, the people in Market Square were stunned into silence, and so was I. This morning, I will go back and see if I imagined it, if it was an illusion, or real. If it is, I have no idea what will happen to Sadima now, or the boys inside the cliffs. This is the Eiffel Tower in Paris, the picture was taken on an night walk. 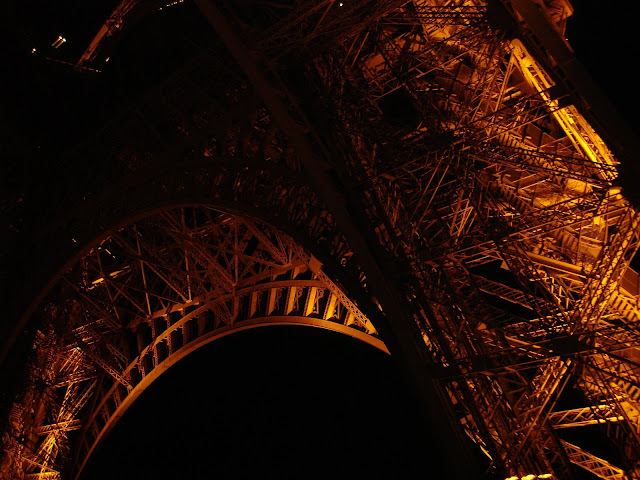 When the tower was built, it amazed the world, a triumph of art and steel, built to awe anyone who saw it. Did more critiques yesterday, two by Skype. Critiques in LA: twenty minutes (they have to, the volume of writers is massive) When I do them from home, average time about an hour. Two more today, later in the day. For now, I am about to sneak onto the green of Limori's Market Square in the middle of the night and see if I can find out who is building this thing. (see below) And why. 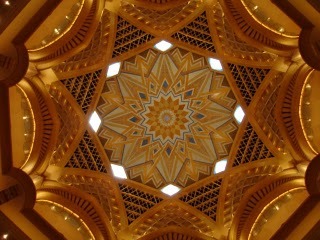 This ceiling is in the United Emirates, in a hotel that was built to accommodate royal visitors. The gold is really gold. The "opera balconies" are about 40 feet overhead. Sunlight pours through the high windows. Somehow, nothing echos, all sounds are hushed. So I was standing in a hotel lobby feeling like a transfixed, rural pilgrim, staring up at a cathedral/shrine/temple roof in 1429. Strange and lovely. 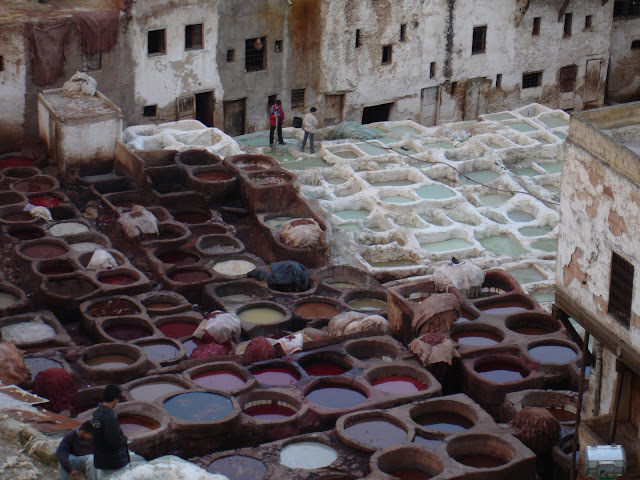 This is in Fez Morocco, a family business of leather tanners and dyers. It was amazing to watch them work, moving sheep skins from one basin to anther. . In Sacred Scars it is the tannery where Sadima sometimes goes to sit beneath the nearby trees, protected from interruption by the piercing stench, knowing that both Grrur and Charlie are close, as close as they can be now. I thought I knew what Somiss wanted, what he has searched for all this time. And I was wrong. I have three writing sessions planned today interspersed with my usual critiquing, tree trimming, planting, gardening, etc. The deepest insights come when I am outside doing something physical. This one did, yesterday. I dropped the shovel and ran for my office. This is an old butter churn. I used it for years...then stopped spending every second of every day to grow and make food....so I could write books. It sits on my kitchen counter, a reminder and an old friend. The voice that came to me has a butter churn just like this one. But she doesn't use it to make butter--or anything like butter. This is Heather Brewer, me, and Ellen Hopkins, in Rochester NY, at a book festival (an AMAZING one) a few months ago. I am including it here because sometimes the weirdness of writing (like any other weirdness) can only be honestly discussed with friends who share it. So, Yeah. We talked writing!!! And when any of us mentioned hearing voices, the other two just nodded. Last night, just a few minutes before I closed up shop, Hahp started talking to me on the screen. And now I understand something in Skin Hunger that had never made sense to me before. I am about to start today's work. Hahp is near the lake, searching that huge dark chamber...he is hoping. And so am I. About to start writing for the day. I kind of dread it this morning because I have come to love Limori and some of the things happening in the city of Limori are happening in my country, right now, too. So I guess even in books people are...people...wary and unfair. This is a South American ice cream bean blossom. It's a pretty, rangy, tree with weirdly shaped leaves. New leaves are a deep blood red that changes to vivid green as they grow...Inga edulis is the Latin name. The fruit, which is not really a fruit, is amazing. It took me a long time to try it, I think because the tree itself is so...unfamiliar. The thing I am wrestling with now is that I have come to love the characters or pity and understand them, or I wish I could help them....so the hard scenes are REALLY hard to write. I have to write with hope, but I have to record what happens without making it up. And, yes, I know that sounds silly, but that is how it feels to me. If *I* write this story, it is going to be untrue--probably at least a little sappy with almost everyone surviving and finding some kind of life. And I know that isn't what really happens. It couldn't. There are too many isolated, protected, powerful people involved. There are too many descendants of massive wealth in the city of Limori, most of whom harbor old hatreds, old rivalries. There is so much decadence, extravagant entertainments,exotic foods and a life-long feeling that they deserve to live this way as the step around the beggar children, annoyed at unpleasant smells. But there is no one with the means to stop it because they also pay guards and buy their loyalty. I woke up this morning knowing this: There are a lot of desperate poor people in Limori, too, many more poor than rich, as is always and ever the truth. This is a teapot, decorated with a bracelet. It sits on a table in South End, in a quiet room waiting for children to arrive. The woman who owns the tea pot is named Theodora Nerak. You haven't met her yet, but you will. So enjoy following the journey with you. When you reread like yesterday, do you edit at all? I'd recently found your "A Resurrection of Magic" series and I want to say that I LOVE IT! VERY MUCH! I just can't seem to put your books down (and that says alot, for a person like me whose concentration is all over the place). I can't wait for the next book :) Thank you for being a writer. I've just finished Sacred Scars and have been searching the internet hoping for some sign of the next installment when I found your blog, and I'm so glad I did! Reading about how you write is facinating, especially as I've started a few novels over the past few years and have many ideas bubbling around in my head. This week for the first time in months, possibly even years I've known what to write, and it's really interesting and quite relieving to see that you still don't know how your story is going to end as I barely know how mine will begin! The way you talk about it makes so much sense, it's wonderful! I also wanted to thank you for Skin Hunger and Sacred Scars. They are some of the most amazing books I have read, completely involving and mesmerising as so few stories achieve. I can't wait until the next one. Everything you said here makes me very happy! Good luck with your own writing.It's an odd,interesting--and incredibly rewarding--experience. Anyway, so many things have been going through my head. I keep making up different scenarios that could happen in book 3, but then ultimately decide that that wouldn't happen. It's so frustrating because I really want to know what will happen! As soon as book 3 is released in stores, I will run over everyone with a bulldozer to get the first copy! I honestly cannot wait to read it! Will Hahp and the others escape? Can their pact overcome Somiss? Will Sadima see Somiss, Franklin, or Jux again? What really happened to Sadima's memories, hair, and mortal life? Will Sadima and Hahp ever meet? Have they ever met before? The suspense is killing me! Please tell me that you're almost done! Jacqui, I am not almost done, but I am getting there....and all these questions will be answered. There are more writing updates here ((#6 and #7))if you want to follow the process. They won't answer your questions either really, because I can't but...there are lots of pictures and hints and my own emotional reactions to writing the book. Thank you for liking my books. I can't begin to tell you how happy that makes me.